I've done a little bit of sewing this week: Here is my second attempt at the Box Kite block by Angela Pingel from Modern Blocks by Susanne Woods. A huge thank you to your comments and help last week when my first attempt did not work out so well. I'm very happy with this one! Next up is the April Bee Block called Potager by Yvonne Malone also in Modern Blocks by Susanne Woods. The Nicey Jane fabric is so cute - too girly for me but fun to work on and send back to its home. Dresses and skirts - fabrics and patterns are calling out to me to be purchased and made for summer. Yea summer is coming! 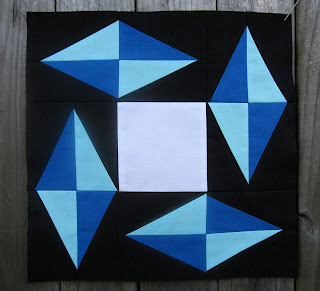 Please visit Lee at Freshly Pieced to see what others have in their WIP for this week. Go see her Going Coastal quilt - I just love it. Your blocks turned out fabulous! Love them! Sure hope you do get to do some of that garment sewing, I have the itch too! I really like both block patterns. I hope to learn how to make a t-shirt quilt soon. Hi Susan. I listened to your last podcast today on the way to work and home again, and your happiness was contagious! Thanks for brightening up my day. Hooray for success on the box kite! I love the Nicey Jane block. So pretty! I have had those drawstring bags on my to-try list for ages. I think my little hot wheels collector needs a few. Can't wait to see yours. What exactly is this sport they do? oh your blocks look great - yeah!Good luck on your other projects & let me know what you think of the bag pattern - I really enjoy it! Your blocks are beautiful Susan. I love love the Nicey Jane block. The Going Coastal quilt reminds me of my Jelly Roll Race quilt. The redone blocks looks GREAT. I trace from books and then go over with a ruler.